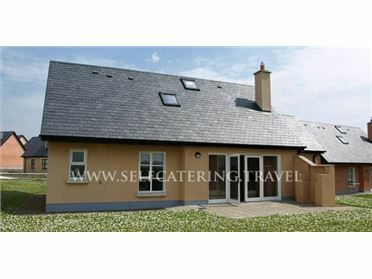 16 Lakeview Villas is a delightful, semi-detached holiday home in Killarney, County Kerry. With three bedrooms, including a ground floor double with en-suite shower room, the property can sleep up to six people. There's also a family bathroom and an open plan living area with kitchen, dining area and sitting area. Outside, there is ample off road parking along with a front lawned garden with patio area and furniture. 16 Lakeview Villas is a delightful holiday home in a lovely location near the popular town of Killarney and Ireland's beautiful Ring of Kerry. The thriving town of Killarney nestles amidst deep, lake-filled valleys at the heart of the beautiful south west of Ireland. This popular holiday destination offers an abundance of traditional pubs, fine restaurants, a colourful theatre and a host of good shops. Electric storage heaters with electric fire. Electric oven and hob, fridge, washer/dryer, TV with Saorview, DVD, selection of books and DVDs. Fuel and power inc. in rent. Bed linen and towels inc. in rent. Ample off road parking. Front lawned garden with patio and furniture. Sorry, no pets and no smoking. Shop 1 mile, pub 10 mins walk..